My panel connected to a computer. This is my first article about a project I have been working on for some little time now. I’m presenting it now because I finally got some important features of this project working. Depicted above is my hardware for this particular project. The “control panel” was once part of a now-replaced flight training computer program. It supposedly represents some of the controls on a Cessna airplane. It was meant to be attached to an old-fashioned game controller to give it a “flight yoke.” I added the basic parts of such a game controller to the top of this panel, but am not using it yet, and probably won’t. 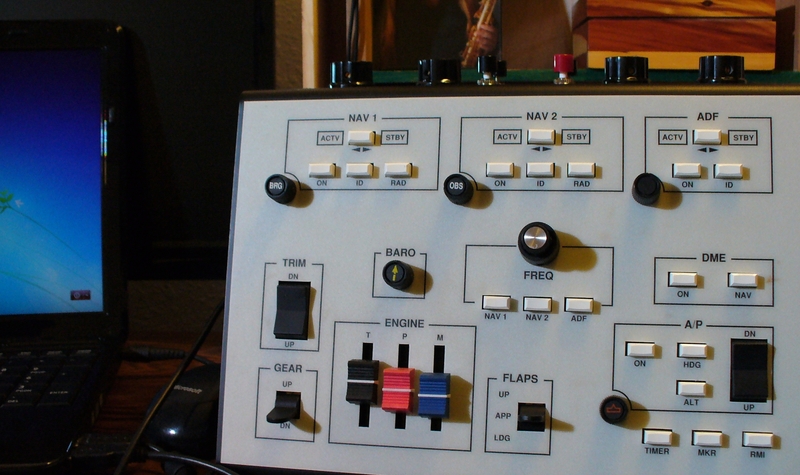 This panel is operated by a microcontroller that talks to the flight simulation computer program over an “old fashioned” serial communication line. These days microcontrollers are equipped with “flash” memory to hold their programs. This type of memory is permanent, but its contents can be changed. The older microcontrollers were programmed once and that was it. So there was no way for me to adapt this panel for my own use. I had to rewire it with a new controller somehow. I found a way to do it (which I won’t get into here) using a Digilent product much like the Arduino Uno that I thought would have enough pins to connect to all these buttons. This product was purposely made to be programmed in a very similar way to the Arduino. As gone over earlier, this means this product uses a programming system that is a standard used for many different purposes today. So, after installing the new microcontroller in the panel, I worked out – over a period of many weeks a few hours at a time – a program that would send out data about the panel. The code for this is gone over below. I needed a program running on a computer to stand in for the flight simulation program that went with the original control panel. The original program was made for Windows. Those programs are a bit difficult to write! But there are several ways these days to achieve a similar effect. And one pretty good open source program-writing resource is Processing, which I covered briefly in a previous post. I discovered that Processing had a little code “library” (a collection of usually short programs that adds a certain feature) for “old fashioned” serial communications. Many modern microcontrollers communicate to the computer that is used to program them through a USB cable that is set up to mimic an “old fashioned” serial communication line. So all I had to do with the panel was program it to send “old fashioned” serial messages through its USB cable (which also powers it) to the host program written using Processing. Below is a screenshot of a generic panel program I wrote using Processing to receive and display data from a panel of up to 64 (8X8) separate controls. Most of these controls would ordinarily be switches, and that is the only functionality I have implemented so far. This panel has two other types of controls besides switches: Rotary switches called “encoders” and sliding controls that can be assigned numerous values depending on position. These are a little bit trickier than switches to code for, so I’ve left them for later. This application shows a grid of colored rectangles with some text in them. They switch colors depending on data received from the physical panel. This screenshot shows that some of the positions on the panel are open or inactive (grey). A “1” from the panel results in a yellow box and a “0” results in a red box (I was going for something more orange, but I liked this color better). So this application just gives us a start at writing a host program that can take data from a control panel and act on it, do something with it. Screenshot of the Processing application that displays the state of the panel. With some trepidation, I present below the code more or less as I have written it so far. The data behind the slashes are “comments.” This is information that helps the program writer explain to himself or others what he or she is trying to do with a line or section of code. The following code was written on the Multi-Platform IDE for uploading into the microcontroller that is wired into this panel. out the result on a serial communication line. Modified extensively for the FS-100 application. to make sure the host is ready for the next message. // 8 by 8 array holds previous state of the panel to compare to. // 8 by 8 array holds most current state of the panel. // Below are the data lines that will be read by this code. inverting transistors ("buffer") that output 5 volt signals. Reset needs a high pulse, so I give the buffer a low pulse. This reset pulse is for the rotary encoders, not yet implemented. delay(5); // delay() introduces a time lag in milliseconds. delay(5); // delay() helps make sure your timing works out. for (int i=0; i<8; i++) // this line implements a "loop"
prevValues[i][j] = 0; // This fills one array with zeros. Serial.begin(9600); // This activates the serial comm line. to contain code that will be repeated over and over again. This IDE calls this loop() as it does not draw to the screen. at that address (up to 8) and reading their values. controls. These data go into the valueArray. Start with address 0 which is 111 inverted. Output enable (on pin 6) is active-low. That means issuing a LOW turns it off (makes it HIGH). digitalWrite(6,LOW); // Ensure outputs are disabled. digitalWrite(6,HIGH); // Now enable the control outputs. // Below illustrates how an array is addressed in code. Next step is to loop through and compare old values to new values, etc. // Here is where we implement the semi-handshake. // If we don't get an answer in 100 milliseconds, send the data anyway. Now transfer new values to old values using loops. * Larry Cox 2014. Developed from "Simple Read" and other code examples. * This code was tested 29 April 2014 and worked with loopback cable. import processing.serial. *; // This is the serial communication features. int ports;       // Number of ports in list of serial ports. String titleStr; // via out serial port. int cols = 8;    // For the display grid. int rows = 8;    // For the display grid. Cell Panel;  // Cell is a special object that displays as a grid. size(800, 500); //Initial window size. ports = Serial.list().length; // Find out if any ports are active. if (ports > 0) // If one is, assume it's the first one (index = 0). // I create an informational title string. myPort.bufferUntil('\n'); // '\n' means a linefeed in the C language. Panel = new Cell[cols][rows]; // This is called a "constructor." background(255);             // Set background to white. fill(rate);                  // Fill color for update ticker. ellipse(750,25,40,40);       // Draw update ticker. fill(0);                     // Set fill to black. text(titleStr,2,2,700,20);   // Draw the title. for (int j = 0; j < rows; j++) // create a row of cells. // This line initializes each object in turn. Panel[i][j].display(); // Draws the panel a rectangle at a time. // I want an indicator to flash at the speed I'm updating the display. the byte value set in the bufferUntil() method in setup(). This is the crucial code that responds when data are received. inputStr = trim(inputStr);  // Just in case it contains junk characters. valueArray[i][j]= int(k); // Updates array contents - crucial! myPort.write("000"); // Send a string to serve as a test and to ask for more data. // A cell object knows about its location in the grid as well as its size. String label; // Cell "content"
stroke(255); // Draws a black border. strokeWeight(2); // One of several border options. fill(204); // Fill color for the next object to be drawn. rect(x,y,w,h); // Gives us an array of boxes on the screen. fill(0); // Fill color for the text. // Above line draws text superimposed over the boxes. 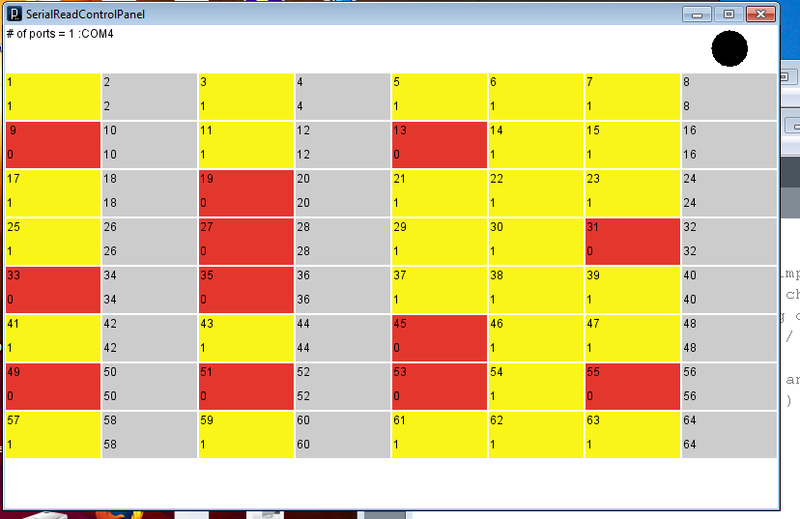 I didn’t capture quite the latest version of my code with the yellow and red logic in it, but this is plenty for now. Monday (the 7th of April) was one of the warmest days of the year so far in Pullman. Having neglecting my weekend grocery shopping, I accomplished it that Monday afternoon and returned home at 4:30 or so. By the evening I was busy with one of my electronics projects. At about 6:30 or so the lights flickered, went out entirely, pulsed back on once again, and again died in what seemed a kind of spasm. It was pitch black in my basement apartment, though not nearly sunset time yet. I fumbled around on my work table until I found my flashlight. I use it to inspect my soldering work. Then I searched around the place for a better source of light. I found a head lamp I had purchased from All Electronics and a shake-light I had acquired I don’t recall where. The head lamp was great for getting around inside. I found my jacket, put on my shoes, and went out to see what was going on. As I went out “front” (the side facing east onto Grand) a car from the fire station up the street drove by with siren on. Other than that, all seemed normal. A couple were above me, leaning on the balcony railing, speaking quietly about the loss of our electric power. So I went back in. I put my head lamp back on, sat down at my work table, and tried to continue on the design I had started, hoping the power would soon come back. But, it didn’t. It was basically too dark to do anything. Inside it was completely quiet, as the fridge – the only source of noise – was off. I resolved not to open it until the power came back up, in hopes that my just-purchased food would stay reasonably cold. There was nothing else to do. Without electric power I was totally without the usual devices that I use day-to-day. My only battery-powered devices are flashlights (I plan to change that some day). I don’t have any “mobile devices” (I don’t plan to change that any time soon). I didn’t rest well, as I kept anticipating the power returning. It finally did at about 12:30. I was needing now to get my rest, so I stayed in bed a while. But all the lights were on. So I finally got up and turned everything off and went back to bed for real. At work, only a few others had experienced the blackout, as it was fairly localized. I heard stories of what had happened, but didn’t look them up myself until today. As it turns out, a distraught person – drunk – had been hurtling south on Grand in her 1999 Chevy van, sending several cars to the shoulder or otherwise off the road. One of these cars swerved off the road and rolled down a hill into a power pole. The impact broke the insulators holding up the high-voltage wires, and they fell to the ground. The driver was trapped in his overturned vehicle by these high voltage wires until the utility company was able to de-energize them about an hour later. He was – amazingly – unharmed. The police caught up with the “crazy” lady a little while later. They had to take her to a hospital to get treated for minor injuries before arresting her. One of the news sources published a Sheriff’s Office photo of the lady – from some earlier incident. I edited it down to just the face for this post: This is the face of a very distraught being. That same weekend I received a portion of an instrument panel from a DC-8 aircraft. This was one of the first jet airliners to be mass-produced during the 1960s. I bought it for the aluminum panel and to see how it was constructed. It arrived a bit the worse for wear, but I took all the parts off it and cleaned it up, and it looks promising. I think I will make a battery charger with it. 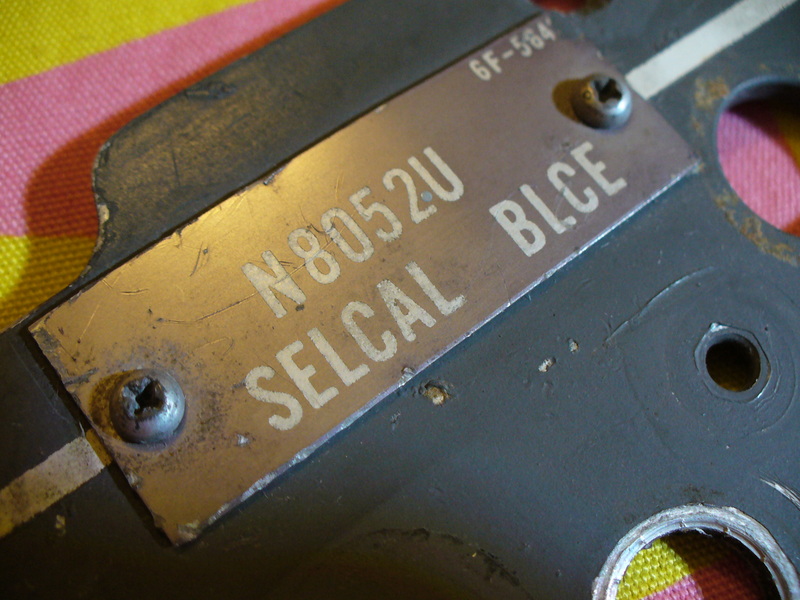 DC-8 panel detail, showing the registration number of the aircraft it is from and its most recent “SELCAL” radio message code. This afternoon walking home, I saw a family of deer grazing in the field below the “industrial park” where I work. It looked like a buck and three doe. Probably the same deer that were here last year. They somehow managed to live down in the wetlands that the bike/jogging trail goes through, just the other side of Grand. That’s where the electric poles are, too; like the one that guy ran into. I wasn’t sure they would return. Last year they were here earlier. I remember seeing them in the same place when it was still snowy. They lost one of their young to road kill that year. I know: I saw the dead deer myself. It was at the “vacant lot” where I took many of my wildflower pictures. So I thought they might go somewhere else this year. But there probably aren’t too many other places to choose from for these deer. They do have to be watchful, and not only for cars. I’ve seen coyotes in this area, too; though its the rabbits who usually suffer when the coyotes come through. This post is an experiment for me. I don’t usually describe how I do my design work. The objects, generally speaking, are not that photogenic, and electronics is a bit of a dry subject. But some people just aren’t familiar with it, and they should be. This is the age of electronics on earth. 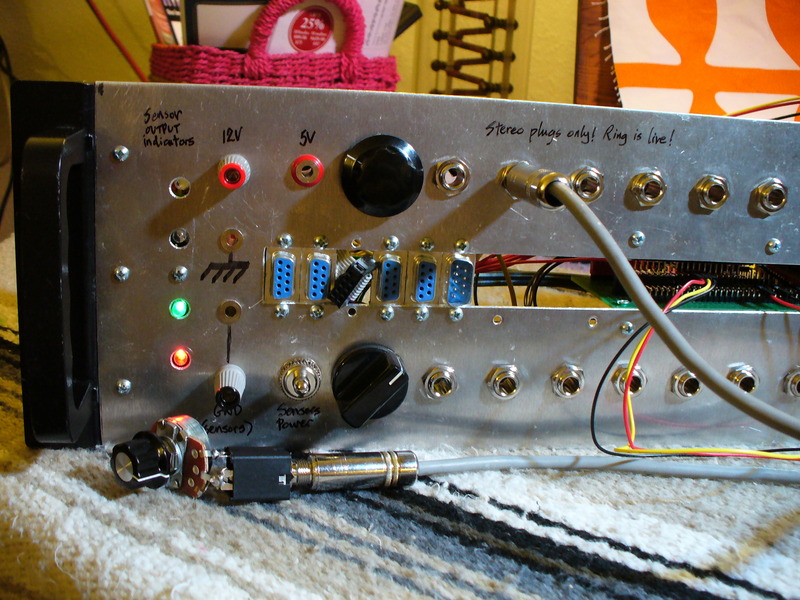 My patch bay – right side. While some electronics designers work within the framework of marketable consumer or industrial products, I don’t. It’s strictly “for fun” you might say. But any designer requires opportunities to do his or her work. After all, you can always buy OTS (off the shelf) if the item you want has already been designed. 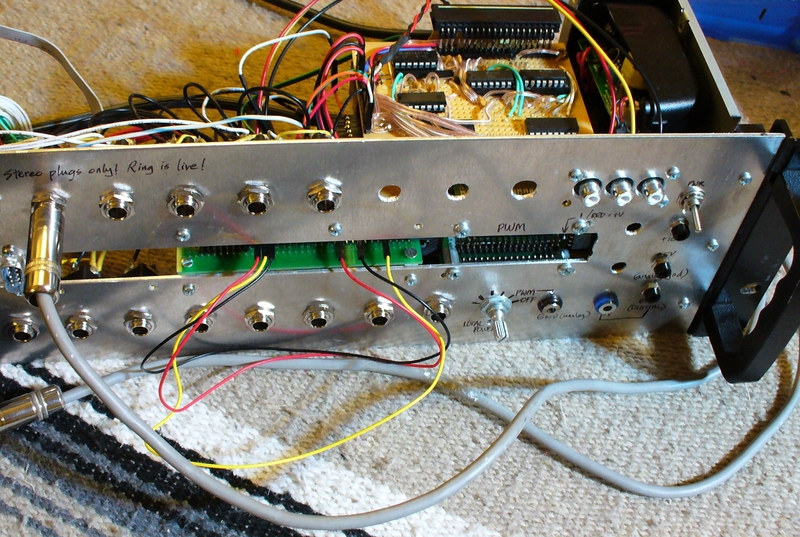 I had made a “patch bay” – a kind of interconnection panel where lots of signal connections come together at the same place – for signals used to control my displays. I had purchased a blank piece of aluminum from a local welding shop, cut a slot down the middle (don’t ask me how) and drilled a bunch of holes in it for switches and connectors, then started loading it up with circuit boards. But on the far left end I had four holes where nothing really seemed to fit: A design opportunity! I decided I wanted a voltage indicator that used four LEDs that got brighter as the monitored voltage got closer to each one’s center setting. The usual bar graph, of which I had made many using a commonly available part, uses ten LEDs that just go on when the input voltage goes above their set point, and off when it goes below. There is also a “dot mode,” which I like to use because it uses less power, where the LED whose set point is closest to the input voltage is the only one that goes on. I didn’t want to use ten LEDs in the usual way. I wanted to use only four and have them get brighter and dimmer, the way my light panels are designed to do. I wanted each one a different color, but I only had three colors on hand, so the middle two are green, the top is white and the bottom is red. The red LEDs I have are a good deal less bright than the other colors, so I had to try to compensate for that, too. My patch bay, left side. I decided to use the dot display IC as the central component in this project. The two bottom outputs would go to the red LED. The next three to the lower green. The next three to the upper green, and the top two outputs to the white LED. You can set up the IC for so much current per output. Old LEDs required 20mA (milliamperes) to be bright. But modern LEDs only need 2. I tried limiting the current through the LEDs using series resistors. The brightest LED (white) would get a big series resistor (7K – kilohms) the green ones would get smaller ones (I think I used 1.5K) and the red would get the smallest series resistor, something like 100 ohms. These values were arrived at experimentally, and weren’t perfect, but good enough for this project. How do you get an LED to get brighter and dimmer? You can simply drive it with more or less current. But almost exactly the same effect can be achieved by turning it on and off rapidly using a technique called “pulse width modulation” (PWM). This works because the body only takes a picture of its environment about 100 times a second. So any light flashing at about that rate or faster will appear constantly on. In technology, this is most commonly experienced when watching video monitors (or films). The picture on them only changes 30 to 70 times a second, but the motion appears continuous. This image is from my USB oscilloscope. There is a grid with the vertical and horizontal scales shown by the knobs. 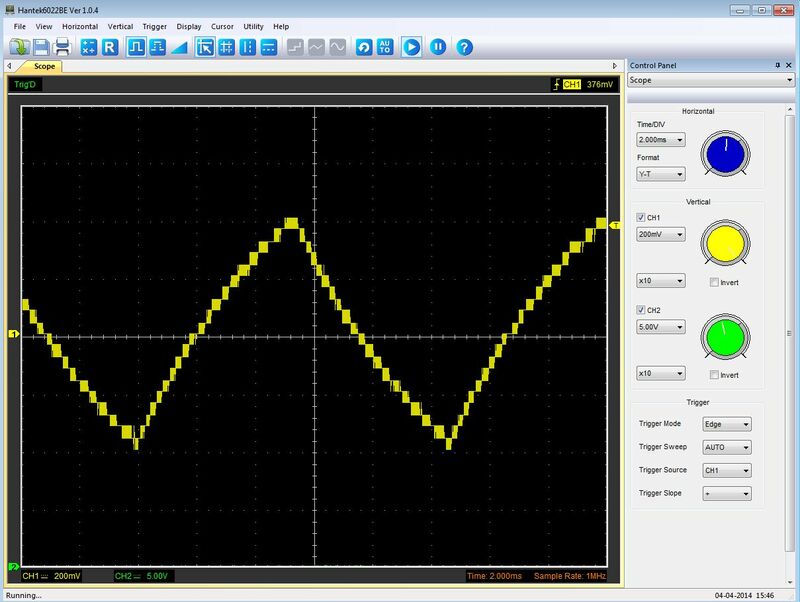 The period of this waveform is about 10mSec (milliseconds) and the amplitude is about 800mV (millivolts) peak-to-peak. So it’s oscillating at about 100 Hz (Hertz, cycles per second) and it’s about a volt high. The entire scale of my meter is 2.5 volts, so this signal should activate about 4 outputs at one time, with the one at the center of the oscillation the brightest. I coupled this signal to an amplifier through a capacitor, then made the DC (direct current – not oscillating, or changing very slowly) level of the amplifier equal to half the input signal (0 to 5 volts). This created an input signal to the dot display IC of a triangle waveform going up or down depending on the slowly-changing DC level being measured, centered at zero to 2.5 volts, the input range of the dot display IC. 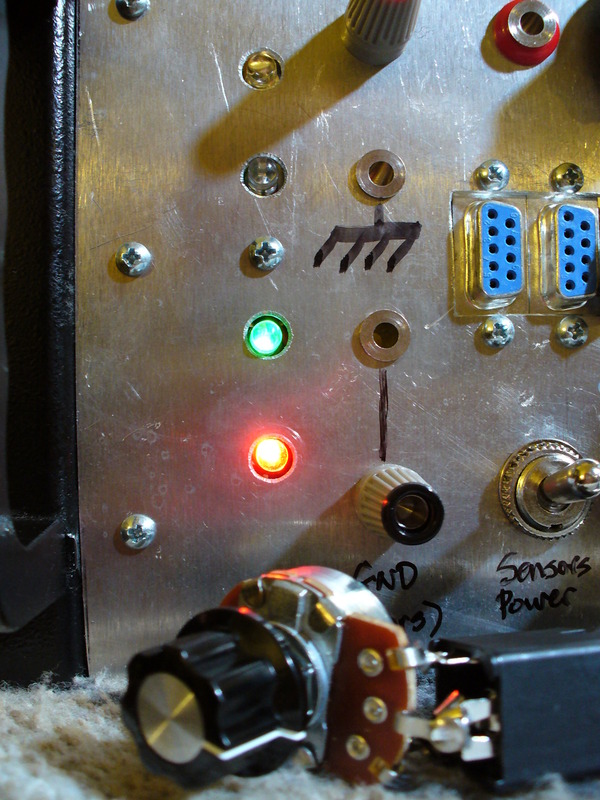 With the input set lower (see knob) the red LED is brighter than the lower green (by a little). With the input set higher, the white LED is brighter than the top green. The effect is quite noticeable, particularly to the eye (less to a camera). I was pretty happy with the outcome. The range of voltages I use for my analog projects is zero to five volts, so that’s the only range my indicator needed to have. Since the electronics run on +7V and -5V, they can’t put out much more than 5 volts anyway. But I noticed a funny thing happening with my USB oscilloscope when I didn’t connect it to my signal through a capacitor (to block the DC component of the signal). It was “clipping” off the top of the waveform! My cheap little USB oscilloscope only has a display range of plus and minus 5 volts! (at least at the settings I was using). This is a very small DC range for a professional oscilloscope, where more like plus and minus 50 volts is what is expected. This little scope had no DC offset built into the front end (all good scopes do) so if the signal goes beyond certain limits, it just disappears. 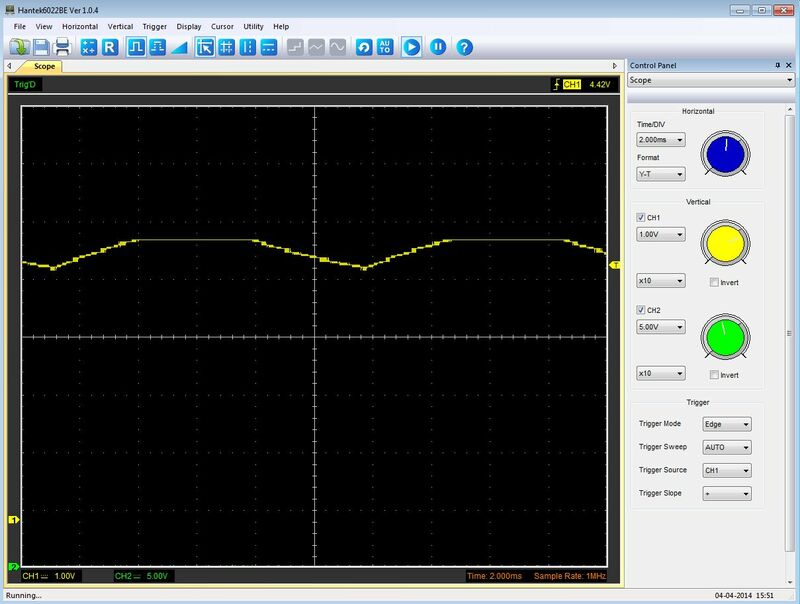 Here is a trace of the 12volt square wave that creates the triangle wave. Notice that it stops at a little under 5 volts. This means I will have to build a more compliant front end onto my scope if I want to see the entire waveforms in my 8-12volt projects. I hope this post gives some small insight into the electronic design process. I kept it conceptual. The hardware details are VERY dry. You just look up the data sheets of the parts you decide to use and figure out how to connect the correct pins together. 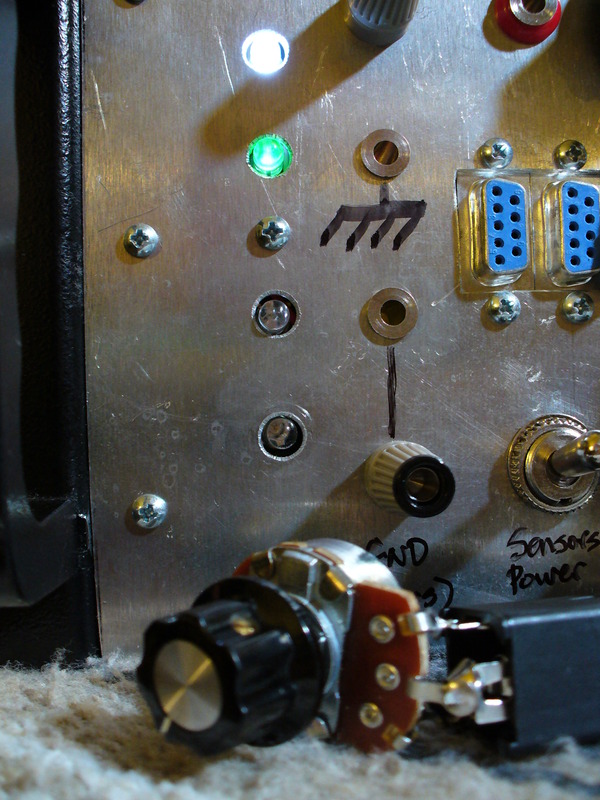 There are certain real-world considerations to take into account, such as using bypass capacitors on the supply pins so signals don’t get into the circuit in unexpected ways. And you have to know how to solder if you want to make a permanent circuit board. Solder is hot metal and it has stuff inside that smells pretty bad when it burns, so a lot of people don’t like it and I don’t blame them. It’s a great technology for military equipment, but hobbyists could probably get by with conductive glue. Anyway, I rarely get real comments on this blog and would appreciate some. They don’t appear immediately; I have to go through them and approve or disapprove them.